Pustular psoriasis is the most severe form of psoriasis with two main types: localized and generalized. In the generalized form, whole body may be involved and the course is subacute, acute or even life threatening. We report here a case of subacute generalized pustular psoriasis successfully treated with oral zinc. A 67-year-old female was admitted to our hospital for uncontrolled diabetic status and multiple erythematous and pustular lesions over anterior trunk and extremities for three weeks. The initial skin lesion started as erythema and pustules over lower abdomen and medial thigh, which gradually spread to involve anterior trunk, groins and lower extremities including soles. There were no systemic symptoms. The general and systemic examination revealed no abnormality. The cutaneous examination showed multiple, irregularly shaped, discrete and confluent erythematous plaques topped with pustules predominantly involving abdomen, flexural areas and extremities including soles [Figure 1]. The plaques showed exfoliation at the centre and pustulation at the periphery. Lakes of pus were seen at places. Examination of scalp showed confluent erythematous plaques with silvery scaling. A histopathological examination of the lesional skin taken from right thigh showed parakeratosis, focal loss of granular layer, unilocular spongiform pustule in spinous layer and superficial perivascular lymphocytic infiltration [Figure 2]. Gram staining and KOH mount from pus revealed no microbes. The routine blood investigations showed leukocytosis. The fasting and postprandial sugar was raised. The culture from blood, urine, and throat swab was negative. Hepatic and renal function tests were within normal limit. Serum calcium was within normal range. The patient was diagnosed as subacute generalized pustular psoriasis. Oral zinc acetate equivalent to elemental Zinc 50 mg twice daily was started along with topical antibiotic. On the fifth day of Zinc therapy, new pustulation stopped and old lesions started healing. Marked improvement of lesions was noticed after 10 days and there was complete clearance of lesions in another 15 days [Figure 3]. There was no relapse at six month of follow-up. Our patient developed subacute form of generalized pustular psoriasis at 67 years of age where potentially toxic drugs could not be given. She responded well with oral zinc, which could be a better substitute in elderly with systemic diseases. This is probably the first case report of subacute generalized psoriasis successfully treated with oral zinc. However, further clinical trials are required to show the efficacy of oral zinc in pustular psoriasis. 1. Millian G, Katchoura V. Psoriasis pustuleux generalize. Bull Soc Fr Dermatol Syphiligr 1933;40:851-3. 3. 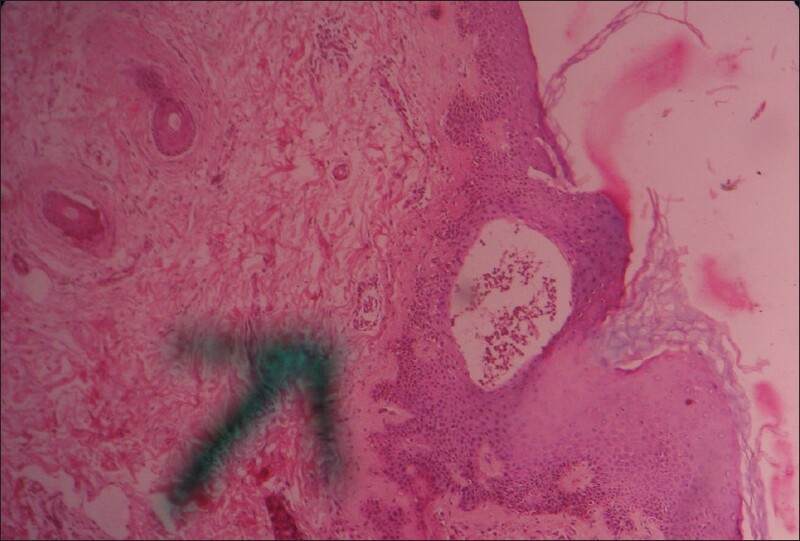 Portnoy B, Molokhia M. Zinc and copper in psoriasis. Br J Dermatol 1972;86:205. 4. Leibovici V, Statter M, Weinrauch L, Tzfoni E, Matzner Y. Effect of zinc therapy on neutrophil chemotaxis in psoriasis. Isr J Med Sci 1990;26:306-9. 5. Valins W, Amini S, Berman B. The expression of toll-like receptors in dermatological diseases and the therapeutic effect of current and newer topical toll-like receptor modulators. J Clin Aesthet Dermatol 2010;3:20-9. 6. Gilliet M, Conrad C, Geiges M, Cozzio A, Thürlimann W, Burg G, et al. Psoriasis triggered by toll-like receptor 7 agonist imiquimod in the presence of dermal plasmacytoid dendritic cell precursors. Arch Dermatol 2004;140:1490-5. 7. Jarrousse V, Castex-Rizzi N, Khammari A, Charveron M, Dréno B. Zinc salts inhibit in vitro Toll-like receptor 2 surface expression by keratinocytes. Eur J Dermatol 2007;17:492-6. 8. Bak H, Lee WJ, Lee YW, Chang SE, Choi JH, Kim MN, et al. Expression of neuropeptides and their degrading enzymes in ACD. Clin Exp Dermatol 2010;35:318-23.